The Mountain that Loved a Bird is one of my all-time favorite books. Ever. I have told it numerous times and invariably listeners find themselves enraptured. It is the tale of a mountain made of bare stone. No rivers or streams flow from it. No plants or animals have ever touched its surface, until one day a small bird stops to rest on its side. The mountain has never known anything like this bird and desperately wants it to stay, which of course it cannot. That deep desire to connect and the kind loyalty of the bird, however, are enough to crack open big changes in the mountain. This story is beautiful, the language spare, and the outcome completely uplifting. It is a story of renewal and hope, loneliness and connection, and ultimately the irrepressible force of life in and around us. It has found world-wide acclaim and has been translated into many languages. There are two English language versions that I am aware of. The first was illustrated by Eric Carle and is no longer in print, but can be found in many libraries and through used book stores. 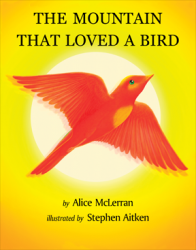 The other English version was illustrated by Stephen Aitken and is published by Tulika Books in India. The author, Alice McLerran, negotiated the rights to the text shortly before the book publishing world was rocked by the forces of e-books, print on demand, and looming e-tail monopolies. She is currently looking for a publisher to release the book again with its new artwork from Stephen Aitken. Let’s hope she finds one soon – this is an enduring and beautiful tale that should be in the hands of adults and children in the US too (it’s all over the rest of the world). As I mentioned above, I have told this tale many times in worship services and it has always played very well. It can be read of course too, but the narrative structure is very strong, the characters solid, and the plot fairly easy to follow. It is fairly long, so requires more effort to learn than say a 500 word story, but it is well worth that effort. Either way you present it, this one will be a joy! This entry was posted in Picture Book, Story for Telling. Bookmark the permalink.